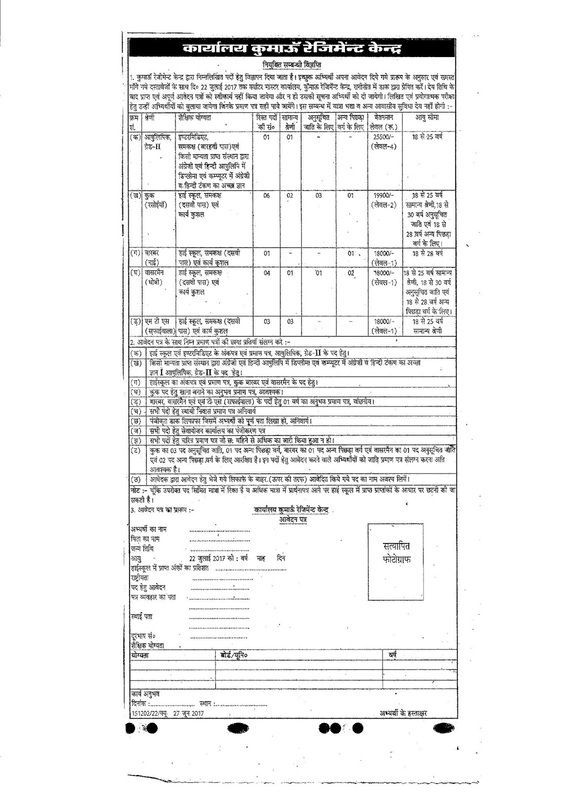 Indian Army, Kumaon Regiment Centre Ranikhet has released notification for filling up the following civilian vacancies of Steno, Cook, Barber, Washerman and MTS (Safaiwala). Eligible candidates may apply for KRC Ranikhet Vacancies in the prescribed application form. Kumaon Regiment Centre (KRC) Ranikhet Recruitment, Steno, Cook, Barber, Washerman, MTS Jobs as application form, vacancy details, eligibility etc latest information is given here. Stenographer – 12th pass or equivalent qualification from a recognised Board and Diploma in Hindi Stenography with typing knowledge in Hindi & English on computer. Cook, Barber, Washerman and MTS – 10th pass or equivalent qualification and proficient in respective trades. Selection process will consist of Written test and Practical/ Skill test. Eligible candidates may apply for KRC Ranikhet Civilian Defence Vacancies in the prescribed application format by downloading from the link below. Send application form complete in all respect along with self addressed envelope and attested copies of 10th Mark sheet & certificate, 12th Mark sheet & certificate, caste certificate, domicile certificate, character certificate, employment office registration certificate, experience certificate etc via Post to “Quarter Master Office, Kumaon Regiment Centre, Ranikhet” so as to reach on or before last date. Envelope containing application must be superscribed as “Application for the post of____”. For application form and other details about KRC Ranikhet Recruitment download the recruitment notice from the link provided below. Search any information available on this site by the help of Google custom search box above. You may visit later for other latest updates related to Kumaun Regiment Centre Recruitment, Defence Civilian Vacancies, KRC Ranikhet Jobs etc.